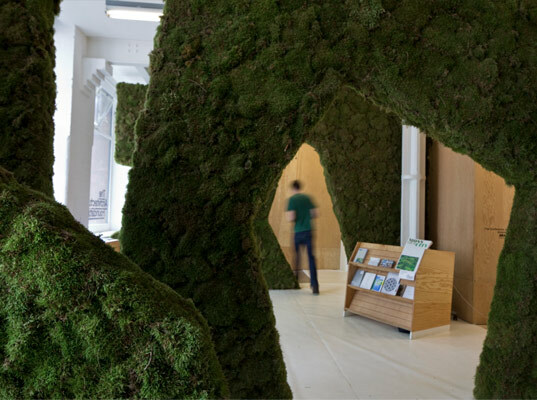 Norwegian design studio PUSHAK recently installed a breathtaking series of moss-covered arches in the entry and gallery space of The Architecture Foundation‘s London headquarters. Dubbed Moss Your City, the project was installed during the London Festival of Architecture as a part of the foundation’s international exchange program, which promotes emerging architects in both Norway and the UK. The project encourages individuals “to become foresters in their own city” by participating in guerilla gardening actions. Moss Your City presents a series of grand architectural structures that represent PUSHAK’s local Norwegian landscape combined with the specific site conditions within London’s urban environment. The installation serves as a hub for activity and provides a great space for festival events to take place. Moss Your City is suggested to be the “well behaved little cousin” of the Bankside Urban Forest, an initiative that brings awareness to guerilla greening projects. PUSHAK’s mission is to create built environments that re-think traditional planning methods and prove that environmentally-friendly design can become a positive component of contemporary architecture. The Moss Your City exhibition (which was originally scheduled to end today) has now been extended until August 12th. Into guerilla gardening? Check out more examples right here. Check out more of PUSHAK's work here. If you haven't checked it out yet, what are you waiting for? Tetrahedral cutouts serves as pathways through the exhibit. 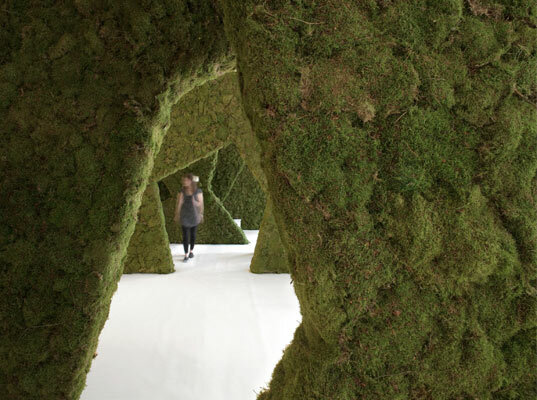 The exhibit consists of large geometric slabs covered with a layer of green moss. A closeup view of the moss. They want to prove that environmentally-friendly design can become a positive component of contemporary architecture. PUSHAK's mission is to create built environments that re-think traditional planning methods. Moss Your City is suggested to be the "well behaved little cousin" of the Bankside Urban Forest, an initiative that brings awareness to guerilla greening projects. The installation serves as a hub for activity and provides a great space for festival events to take place. Moss Your City presents a series of grand architectural structures that represent PUSHAK's local Norwegian landscape combined with the specific site conditions within London's urban environment. 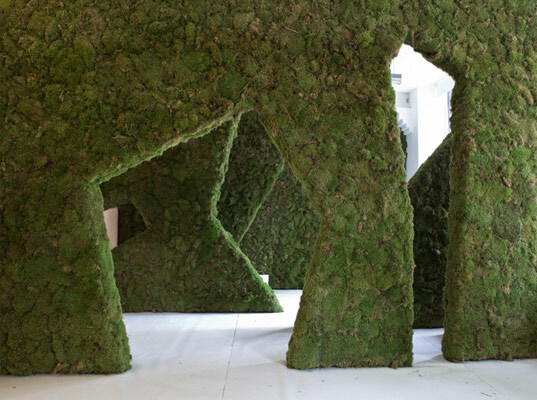 Norwegian design studio PUSHAK recently installed a breathtaking series of moss-covered arches in the entry and gallery space of The Architecture Foundation's London headquarters. Dubbed Moss Your City, the project was installed during the London Festival of Architecture as a part of the foundation's international exchange program, which promotes emerging architects in both Norway and the UK. The project encourages individuals "to become foresters in their own city" by participating in guerilla gardening actions.